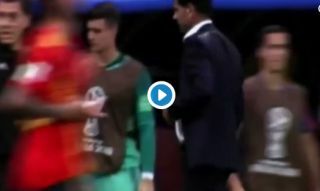 Footage has appeared to capture Atletico Madrid striker Diego Costa warning Spain manager Fernando Hierro that Koke would miss in the penalty shoot-out defeat to Russia. Costa’s club team-mate was picked to take a crucial spot kick and did in fact end up fluffing his effort as Russia eventually went through to the World Cup quarter-finals. This defeat was a big blow for Spain, and it seems Hierro can’t say he wasn’t warned about it. The footage below, coming from Spanish TV, seems to show Costa clearly reacting badly to Koke being picked and having words with his manager about it. After Koke’s miss, there is also a shot of the former Chelsea striker glaring at Hierro and appearing to essentially say ‘I told you so’. Diego Costa: "Koke will miss"
If accurate, this is quite an extraordinary clip that raises real questions about Costa, Koke and general morale in the Spain squad this summer. La Roja never really got going and that golden generation that won Euro 2008, the 2010 World Cup and Euro 2012 seems to have passed now, with the country perhaps unlikely to ever have quite that much talent on their books again any time soon.